Leicester edge closer to a top-four finish with a victory Saracens, who missed the chance to return to the top of the Premiership. 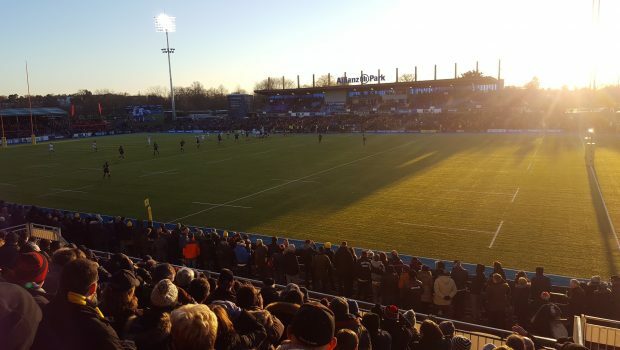 The Tigers claimed a 28-20 bonus-point win at Allianz Park – their first-ever league win at the North London venue. They got off to a strong start and were clinical in the first half as Manu Tuilagi, Greg Bateman and Telusa Veainu all touched down early on. However, Sarries dug in and clung on, with Ben Spencer kicking two penalties as the visitors led 21-6 at half-time. After the break, the visitors secured a bonus point as Jonah Holmes scored their fourth try after being set up by Tuilagi. Sarries then failed to take advantage of some good passages of play, and winger Nathan Earle was twice adjudged by the television match official not to have touched the ball down for potentially game-changing tries. Max Malins scored twice in the final 12 minutes, showing good footwork, but it was too late for Sarries to mount a comeback after the errors made earlier in the game. Saracens started the weekend on top of the league table before Leicester ended their five-match winning streak. With many of their first XV away on international duty, Sarries’ youngsters failed to control Leicester’s half-back Sam Harrison pairing with Matt Toomua who controlled the game comfortably. Tigers had had not beaten Saracens in the Premiership since March 2016. Their win leaves them seventh in the table, four points off fourth-placed Newcastle, while Saracens trail leaders Exeter Chiefs by four. Saracens director Mark McCall said: “We were very poor and never really recovered from the first half when we were on the back foot for the whole half. Leicester director of rugby Matt O’Connor said: “To come down here and win for the first time was a huge effort, but they had a couple of blokes injured in the first half and loads out so we need to keep it in perspective. Pretty accurate. Was there and enjoyed the article as much as the game.